Weddings create the opportunity for joy, bliss and pure love. But, let’s be honest. They can also be agents of stress, command a lot of time and financial investment. As a result, a new trend has emerged and with this trend comes the opportunity for multiple honeymoons. Newlyweds are sprinkling their nuptial bliss over a longer period of time, following their wedding with a mini-moon that doesn’t require an extensive plane ride. Then, after they’ve rested, recovered and cushioned the bank account again, they invest in a longer trip abroad. So, in the spirit of blissful and relaxing mini-moons, we’ve rounded up a list of the best spots (domestic and not too far abroad) to recharge, coming off a flurry of marital activities. You can hop there on a flight that’s just a few hours or less and every couple may view a romantic getaway through a different lens. We’ve selected something for everyone, from fresh mountain air to city escapes to sugar sand beaches, we’ve got you covered. Beachy, romantic getaways are popular in the mini-moon category. Nothing says relax like the sound of ocean waves and no commitments. Costa Rica is becoming a popular destination for post-wedding getaways, as flights are just a few hours from the U.S., yet you find yourself in an entire new realm. It’s not every day you can swing from Tarzan ropes and stand eye-to-eye with monkeys atop trees. 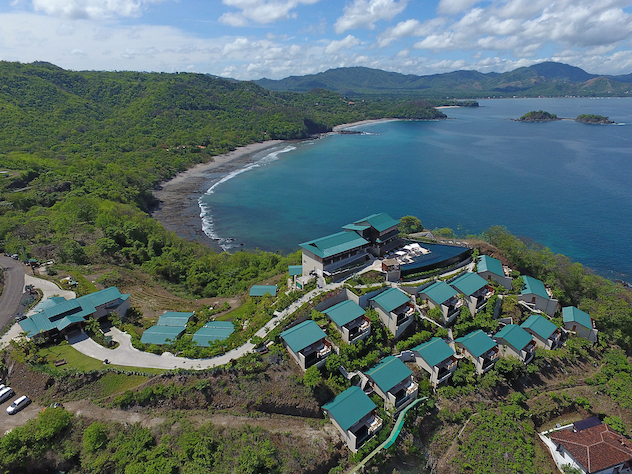 Located on Costa Rica’s pristine and exotic Guanacaste peninsula, Casa Chameleon Hotel at Las Catalinas is perched high on the hilltop above the walk-able town of Las Catalinas. If you look to the sea from Las Catalinas, the Pacific stretches in every direction and beckons with countless activities including snorkeling and kayaking. And just like that, you turn your gaze towards land and discover 1,000 acres of tropical forest, bridges, waterfalls, hills and valleys. The hotel is adults only, with only 21 private villas. So there won’t be overcrowding or swarms of people fighting over activities. 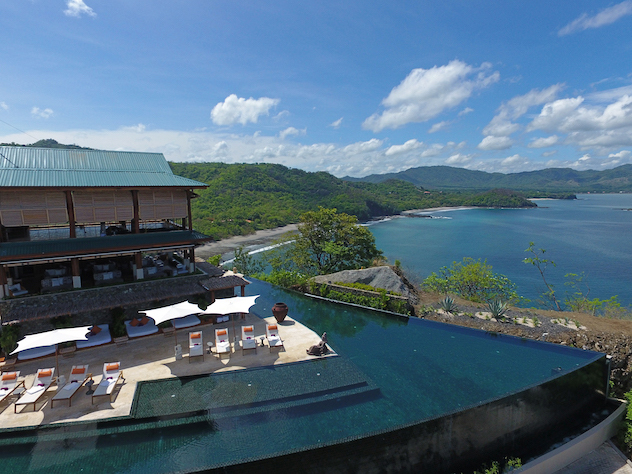 And, each private villa comes with its own personal saltwater plunge pool and ocean views. 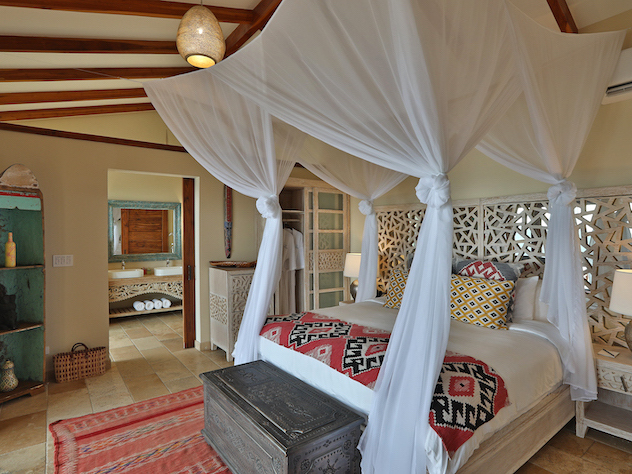 You can even book a private yoga session or spa experience in the comfort of your own room. Just a four-hour getaway from NYC, Antigua is becoming a popular beach destination for honeymooners wanting a quick dash post-nuptial. The resort, Curtain Bluff, is nestled between two beaches. So honeymooners can flip back and forth between the landmarked swimming lagoon on the Caribbean side and a white sand oasis along the Atlantic. The fully inclusive 20-acre luxury resort has all categories of activities and indulges, making couples never want to leave the relaxation haven. The resort also has one of the most extensive wine cellars in the Caribbean; so wine tasting is a must for this getaway, as well as unwinding at the acclaimed spa on property. And of course water activities run plenty. From scuba diving, sailing and snorkeling, there are activities for every day of the mini-moon. What list would be complete without a Mexico destination for a romantic getaway? Mayakoba is another beach destination nestled among lagoons, jungle, tranquil waters and a sugar sand beach. Four luxury hotels can be found within Mayakoba — Andaz Mayakoba, Banyan Tree Mayakoba, Fairmont Mayakoba and Rosewood Mayakoba — each with distinct personalities and amenities. So you have your pick of luxury! Within the coveted Mexican destination are a wealth of lifestyle experiences including four acclaimed spas, more than 25 restaurants with eclectic cuisines and a village square that serves as an event space modeled after the historic colonial plazas in Mexico. In addition, newlyweds have access to a three-mile-long nature trail and spectacular 18-hole golf course. And what beach vacation would be complete without water-based excursions? Guests can cruise through the waterways via boat among more than 300 species of birds and native wildlife, and can even charter a private dinner via boat cruise. Desiring a domestic beach getaway, Key West is an ideal spot with direct flight routes launching from destinations such as Newark, Chicago and Philadelphia amongst many others. Sister Waldorf Astoria properties, Casa Marina and The Reach, both boast the largest private beach on the island where couples can enjoy toes-in-sand dining, jet-ski tours around the island, snorkel adventures and oceanfront spa experiences. For those honeymooners seeking fresh mountain air, The Broadmoor’s posh Cloud Camp in Colorado Springs is an all-inclusive hideaway. The most popular room among newlyweds is the Fire Tower Suite: an actual two-room suite built atop the stone foundation of a historical fire tower. To reach the Fire Tower Suite 145 wooden steps must be climbed that wind up through the forested hillside, past towering pines and giant boulders. When we say hideaway, we mean hideaway. Upon reaching the top, the views of Pikes Peak and the valley below are breathtaking. And a few paces below the bedroom is a private outdoor hot tub. Regardless of the room choice for couples, Cloud Camp guests can indulge in cooking classes, yoga, archery, mule rides, hikes or simply relax. There are plenty of activities to make this mountain mini-moon go by in a blink. Another mountain-centric mini-moon can be found in Santa Fe, New Mexico. Complete with captivating sunsets and pleasant year-round weather, Four Seasons Resort Rancho Encantado offers couples activities right in its own backyard. Couples can enjoy a variety of adventures through the resort’s Adventure Center, such as hiking, horseback riding and tours. The resort also has a partnership with EQUUS, an innovative self-mastery program co-facilitated by horses. This program allows couples to reconnect by exploring how to create safety and trust, how to master the art of being present, the art of non-verbal communication, the power of thoughts, beliefs and intention, and how to inspire rather than control. Talk about getting the marriage off on the right foot! A desert mecca for mini-mooners is just minutes from Scottsdale. Burrowed in Paradise Valley is a hidden gem that was first built in the 1930s, by cowboy artist Lon Megargee. Later becoming Hermosa Inn, this was his residence and art studio. The Inn’s adobe architecture has maintained its authentic Arizona character and charm, but is now home to 43 newly renovated guest casitas. The casitas are sprinkled among a garden setting with vistas of the lush desert and Camelback Mountain. Accommodations come complete with deep soaking tubs, beehive fireplaces and private patios. The restaurant, LON’s at the Hermosa, is complemented by a subterranean wine cellar and outdoor dining patio under the desert sky. Lovebirds can kick off their fairytale mini-moon at a destination with love rooted in its history. Godfrey Barnsley built Barnsley Resort, the storybook site of an 1840’s Southern manor in the foothills of Georgia’s Blue Ridge Mountains, for his wife and love of his life, Julia. As Godfrey Barnsley began construction, Julia fell ill and passed away. It was her spirit that lived on and pushed Barnsley to continue. This 3,000-acre resort offers an invitation to relax, unplug and reconnect with significant others amongst Mother Nature. Here, couples can learn a new skill together with guided lessons for both clay shooting and wing shooting. After giving the shooting lessons a shot, couples can spend some quality time together while enjoying the rest of the resort's romantic activities, including horseback riding through miles of picturesque trails, cozying up around the outdoor fire pits or with a couples massage at the newly renovated spa. For those seeking a city escape, also accompanied by luxurious relaxation, The Ritz-Carlton Chicago is a prime getaway. Chicago is home to countless museums, famous landmarks and dining indulgences. So for the perfect mix or city exploration and relaxation, the Spa onsite is one of the most luxurious experiences, and a must-include for newlyweds. In close vicinity to Lake Michigan, many of the spa treatments offer hydration-inspired treatments designed to nourish the body and renew wellness. The Side-by-Side Suite offers couples the chance to enjoy a massage together in one room. Simply a must for a mini-moon, right? And after renewal occurs, one of the most popular activities for Chicago visitors is a helicopter ride through the city, and over the lake. If we’ve learned anything from the television show, The Bachelor, it’s that picturesque city views and helicopters are one of the most romantic dates on the list. If a helicopter ride isn’t in the cards, the rooftop of the hotel is home to Rooftop at Torali, and panoramic city views are the most popular item on the menu, along with shareable plates and refreshing cocktails. Another city escape on the list is New York City. Since the Big Apple serves as a backdrop for countless romantic comedies, it is the perfect spot to celebrate a newly formed marriage. It’s also home to a myriad of landmarks, dripping with culture and history. If site seeing and exploring are desired, we all know this is the city that doesn’t sleep. A landmark that also serves as a popular spot for newlyweds is The Knickerbocker. One of the most exciting things about experiencing marriage together as newlyweds is stepping out of your comfort zone and planning out-of-the-box date nights on a romantic getaway. Popular among couples visiting the hotel is jazz night at Charlie Palmer at the Knick. Another must-do for NYC mini-mooners includes the view of Time Square and snuggling up in a plush corner sky-pod on The Knickerbocker’s St. Cloud Rooftop. Known for its legendary martinis, this hidden spot is a romantic end to any date night. Especially mini-moon date nights! 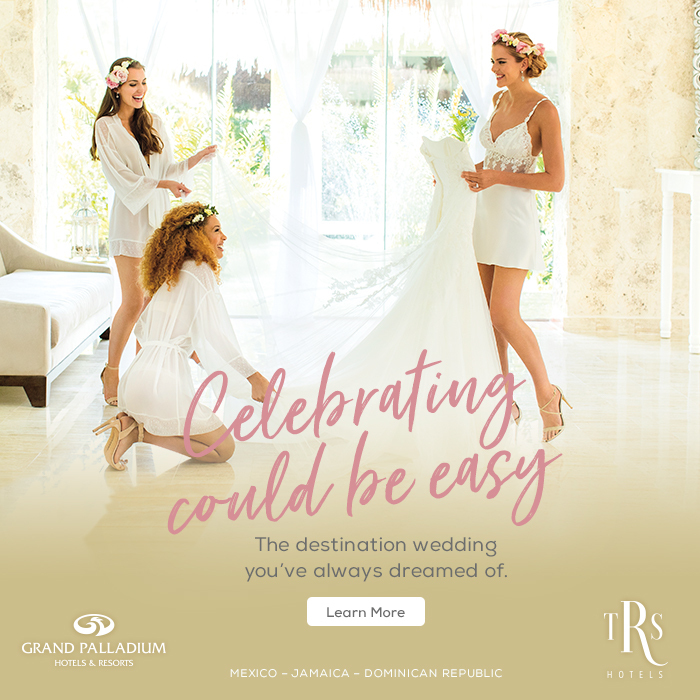 Photo courtesy of (in order of appearance): Casa Chameleon (1st-4th), Curtain Bluff (5th-7th), Bayan Tree Mayakoba (8th-11th), Casa Marina (12th & 13th), Cloud Camp (14th-16th), Four Seasons Resort Rancho Encantado (17th-20th), Hermosa Inn (21st-24th), Barnsley Resort (25th-27th), The Ritz-Carlton (28th-31st) & The Knickerbocker (32nd-35th).